For my second beer I wanted to go back to the world of hoppy beers. Since I had already ordered a beer this weekend that referenced marijuana, I figured I might as well try another one. KALI KUSH is a Herb/Spice beer with a 6.8% ABV. I rolled into Breakwater Brewing knowing nothing about the brewery, only that it was on my way home. I scanned the menu and saw a couple different beers that looked interesting, but only one really jumped out at me. BIERE DU JOUR is an American Wild Ale/Flanders Red Ale with a 6.9% ABV and a practically non-existent 22 IBUs. I still had a third of a glass of beer when they called last call, but I knew that I needed at least one more beer. I ordered a taster of their ROUNDABOUT to finish out my time at Mother Earth Brew Co.
After having ordered a Stone Sublimely Self Righteous to go with my buffalo burger (which was splendid), I wanted something a little more rich for my after dinner beer. 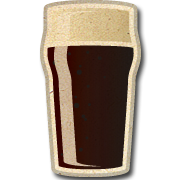 I scanned the beer menu and saw that they had Deschutes Brewery’s BLACK BUTTE XXIII on tap. I’m a big fan of the regular Black Butte and have wanted to try the “special edition” for a while now. Finally I had my chance. 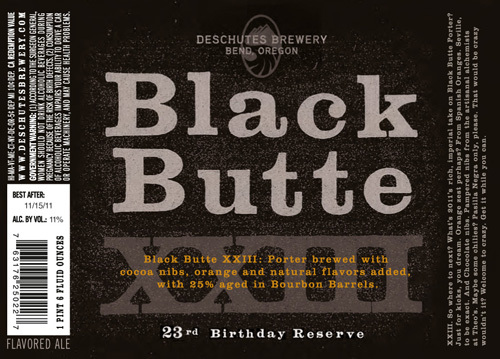 Black Butte XXIII is an American Porter with an 11% ABV and 55 IBUs. I wanted something “smaller” for my final beer of the night since it had been a long and eventful day. Amber Ales are traditionally aren’t known for being big or in your face, so they lend themselves to being great beginning/ending beers. This time was no different. CARLSBAD CHRONIC is an American Amber Ale with a sessionable 5% ABV.